Many artists depict the most diverse images of the Madonna on their canvases, including those with a baby in her arms. Lukas Cranach Sr. was no exception. The painting “Madonna and Child under an Apple Tree” was painted by him at the beginning of the sixteenth century. The canvas is small in size, it is written in oil, but it is believed that part of it was cut off for some reason. 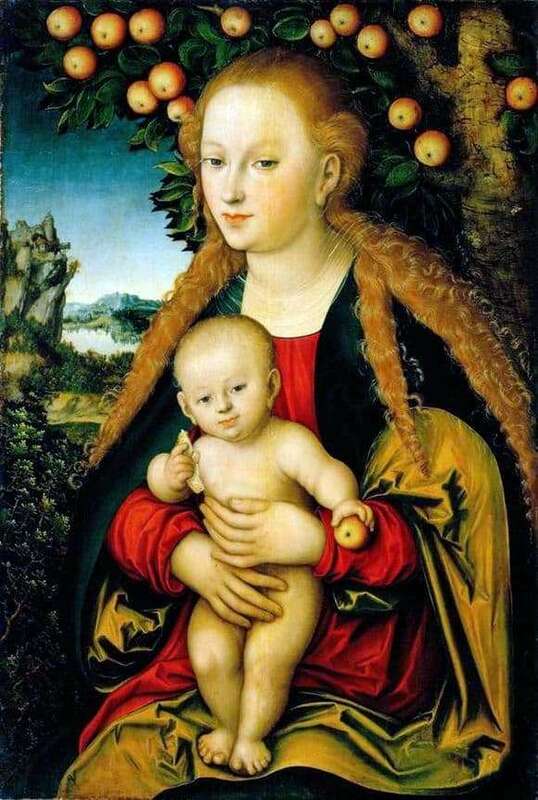 The German master of painting wrote Madonna in the image of the most ordinary earthly, but charming woman. She is in the apple orchard with her baby in her arms. The author clearly wanted to convey through his work the role of the Mother of God, as the main keeper of all that is bright and joyful in the world. That is why the Virgin Mary is depicted on a high mountain. And to make this perspective more pronounced, Lucas the Elder wrote at the foot of a distant blurred landscape. Like many artists, the Mother of God is depicted in symbolic clothing, combining bright scarlet and rich green colors. A similar combination of shades can be seen on an apple tree behind people. Fruits seem to lurk in the shade of dense green. Both the Virgin Mary and the little Jesus somehow intelligently look at the contemplative canvas. With a glance they seem to make it clear that they know about their destiny, but are ready to accept it without any doubt. The eyes of the baby are serious, but not without easy fun inherent in children. But the glance of the Madonna is sad, she realizes that she has to lose her son, she will not be able to do anything, but will happen to meet him again in heaven.